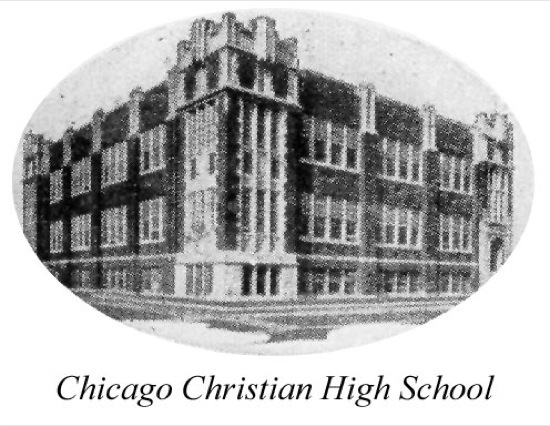 The Chicago Christian High School had been established in 1918 and graduated its first class of commercial students in 1920. The first class of students taking the four-year college preparatory course graduated in 1922; of the twenty-nine students graduating, four were immediately hired as grade school teachers, and two went on to college. Mr. James De Boer was the first president of the board, and he may fairly be considered the founder of the school. Prominent in the life of the First Christian Reformed Church and president of the Ebenezer School Board for a quarter of a century, he early on recognized that the Christian educational system needed an institution of learning that would bridge the gap between grade school and college. Others shared his vision, of course, and after many years of discussion and planning, the Christian Reformed people in Chicagoland determined to establish a high school. Although the greatest push came from the people in my old neighborhood, the board decided to locate the school in an area calculated to attract students coming not only from the old West Side but also from Englewood, Roseland, South Holland, Evergreen Park, Lansing, Munster, Hammond, and other nearby Dutch settlements. Englewood was finally chosen as the site. This precinct of Chicago adjoined Roseland and was in reach of the outlying Dutch communities. Moreover, two large Christian Reformed Churches and a Reformed Church were located there, and these institutions, especially the former, could be counted on to provide strong support for the new venture. The beginnings were modest. The first classes were held in a common dwelling. When the number of students increased, the school was moved into rented rooms situated above some stores on 69th and May Streets. The school was located there when I enrolled on September 8, 1925. The student body then numbered about 150, and it was served by six teachers. Mark Fakkema was the principal, and he taught Bible and citizenship; Jacob Sietsema taught Latin and elementary algebra; Henry Swets taught history, archaeology, and geometry; John De Boer taught grammar, composition, English and American literature, and speech; and Harry Mouw taught general science, physiology, botany, and physics. Adriana Hammekool was the only woman on the faculty. She taught commercial subjects and occasionally assisted in mathematics. I took no courses with her, thus retaining my record of never having been instructed by a female teacher. 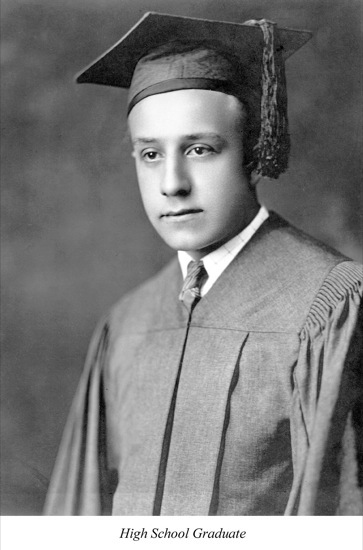 Since I was already seventeen years old when I entered the school, I sought permission to take additional courses each semester with a view to completing the four-year college preparatory course in three years; permission was granted, and I was able to anticipate graduating in June 1928. At the outset of the 1925-26 school year I knew very few of my fellow students. I knew Harold Vander Velde, a freshman like me, because we grew up together on the old West Side. He was three years older than I, but we became fast friends during our high school days. Two men in the junior class John Vander Meer and John Smilde were also advanced in years, and this tended to bring us together; and then there was my cousin, George Stob, who at eighteen was a senior and would leave for college the next year. We knew each other well; I would often visit him and his brothers at his parents’ house on 73rd and Aberdeen in Englewood. I had that year very little association with the rest of the students, although in later years I came to associate in varying ways with Harry Elders, Nick Blystra, Jack Zandstra, and Angeline Nydam. I enjoyed the instruction and addressed myself to my studies with diligence and lan. I have no memory of engaging in any after-school activities. There was a basketball team, I know, but I was not a candidate for it. Generously laden down with overnight assignments, I was wont in those days to return home right after school and repair to the room set aside for me there. Furnished with a desk and with ample book shelves, it was here that in undisturbed solitude I could prepare for the next day’s class sessions. I was sufficiently involved in the affairs of the school to prepare a short essay entitled “A Challenge” for publication in the school annual. I believe that I pleaded in it for an alliance between faith and reason or for what may be called “Christian Scholarship.” Another small writing of mine appeared in the January 1926 issue of The Young Calvinist. Someone had earlier published a defense of the “flapper,” maintaining that “making up” is an art that produces wonderful results “the ugly are made fair and the comely are made pretty.” I opined that to plant a red splash across one’s mouth and to make one’s cheekbones resemble a rose was ill-calculated to enhance one’s looks. But that, I said, was a matter of taste, and I was not concerned to outlaw lipstick and rouge. What bothered me about the “flapper” was her disrespect for convention, her ostentatious revolt against custom, her scandalizing of community mores, her posturing independence, her scorning of traditional values, and her basic licentiousness. I did not put it quite like that at the time, but that was the idea, and I still think that the “flapper” of the mid-1920s was hardly a paradigm of Christian womanhood. Our small family went to church regularly, and my brother Mart and I joined the church’s active young men’s society. Here we struck up close friendships, Mart with fellows of his age and I with those of mine. Five of us soon formed ourselves into a close-knit group Jack Tigchelaar and his brother Fred, George De Vries, Neal Vander Schoot, and myself. We didn’t see too much of each other during the week, but we invariably spent the whole of Sunday together. We met at church in the morning, went home for dinner, and gathered about two o’clock at one or another’s house, where we later ate supper and thereafter walked in company to church for the evening worship service. We took turns. On a given Sunday either Mrs. Tigchelaar, or Mrs. De Vries, or Mrs. Vander Schoot, or Mrs. Stob could expect five hungry young men to sit at her supper table. What we did on summer afternoons was sit on the porch and talk, though we would sometimes walk and talk. On winter afternoons we talked indoors and sometimes gathered about the piano and sang songs. And we smoked. All of us had pipes and tobacco pouches, and quite often we even resorted to cigars. After the evening service, the romantically inclined occasionally sought the attention of some girl; but in that first year at least, we normally drifted singly or in pairs to our respective homes, there to visit with our parents and prepare for the coming week’s work. We discussed religion, world affairs, sports, girls, and whatever came to mind. In 1925, the Scopes trial and the problem of evolution drew our attention, as well as the rise of Al Capone and the emerging gang warfare in the city. We noted that Red Grange had joined the Chicago Bears under coach George Halas, and that the Tribune Tower had finally been completed. We witnessed the inauguration of Father Charles Coughlin’s notorious and “rightist” radio broadcasts in 1926; and we were led to reflect on the sabbath question when we learned that a minister of the Christian Reformed Church, Rev. H. Wierenga, had been defrocked in June of that year for holding deviant views on sabbath observance. I was not idle during the summer of 1926. My brother Tom was credit manager at the Thomas S. Smith wholesale produce store on Chicago’s South Water Market, then located near 15th Street and Blue Island Avenue, and he secured a job for me at the store. I began working there as soon as school let out. I was given a desk in the upstairs office and was assigned the duties of an accounts clerk. For most of that summer I handled the asparagus accounts, thereafter those pertaining to peppers and tomatoes. Tom resigned his position in mid-August and established, with his brother-in-law, the real estate firm of Hendrikse and Stob. But I stayed on until Labor Day and was invited to return the next summer. As it turned out, I worked at Smith’s every summer for the next nine years. When my second year of high school began on September 7, 1926, we were still meeting in the old cramped upper rooms at 69th and May Streets, but a commodious brick building featuring spacious classrooms, a library, a laboratory, a gymnasium, and a large auditorium was in the process of construction on the corner of 71st and May Streets, and we looked forward to moving into it. In that academic year, I was listed as a junior and so had crept up on such seniors as John Vander Meer, John Smilde, John Rottier, Abe Van Kampen, Peter De Vries, and Ann Geerdes. My junior classmates included Harold Vander Velde, Syd Youngsma, Henry Evenhouse, George Vander Werken, Joe Jellema, Ray Hofstra, Bertha Prince, Cecilia Ottenhoff, and twelve other students with whom I associated less frequently and more casually. Our new principal and Bible teacher, Mr. J. Bajema, had replaced Mr. Fakkema, who in June of 1926 had accepted an appointment as director of the recently established National Association of Christian Schools. Miss Hazel Bode was the other newcomer on the faculty; she joined Miss Hammekool in the commercial department. I now became involved in the extracurricular affairs of the school. 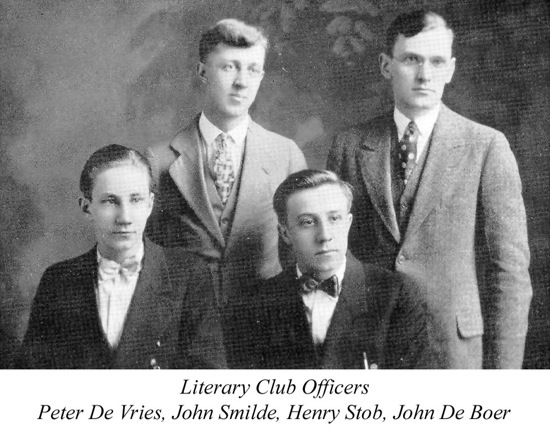 Early in the year, a literary club was organized, and Peter De Vries, who later became a distinguished novelist, was elected president; Mr. De Boer was the faculty sponsor, and I served as vice president. The ten members of the club held biweekly meetings at which we read book reports and considered the various phases of literary production such as style, content, setting, and so forth. With the new gym on the horizon, the students anticipated a marked growth in athletic activities and decided to form an all-school athletic association. At an October meeting I was asked to serve as president of the association; Peter De Vries was elected secretary, and John Smilde was named treasurer. Part of the work of the association was to locate suitable places for basketball practice. When our new gym was ready for use, the association conducted a vigorous fund-raising campaign and collected $900.00. The money was used to purchase needed gym equipment. About this time, Mr. De Boer, the debate coach, issued a call for debaters, and I responded to the call. After tryouts, six of us were selected for the two three-member teams, and I was asked to serve as captain of the group; Peter De Vries, John Rottier, and I constituted the affirmative team, and Robert Van Kampen, Helen Zwiers, and Ann Geerdes constituted the negative team. At issue was the granting of immediate independence to the Philippines. Only two formal debates were held that year, both in Michigan, one against Grand Rapids Christian High School and one against Holland Christian High, on December 15 and 16, 1926. The negative team defeated Holland by a score of 3-0, but lost to Grand Rapids by a score of 1-2. The affirmative team beat both Michigan schools by a score of 3-0. I was practiced in baseball, but I had never up to that time had a basketball in my hands. But I was 5 feet 11 inches tall and, because the junior varsity needed a center, I volunteered to play. 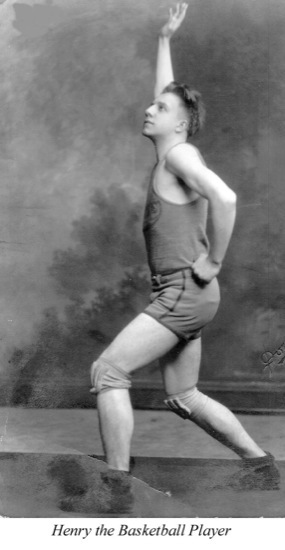 I made my first appearance on the floor on February 4, 1927, just before our new gym became available. We played a number of games thereafter and my skills gradually improved, but the scores we posted that year would scandalize the present generation: we won and lost by scores of 11-8, 14-6, 4-19, 20-19, 15-12, 18-19, 9-30, 15-12, and 22-14. Members of the Junior Varsity were John Rottier, John Baan, Ray Hofstra, Syd Youngsma, Ray Prince, James Erickson, and myself. I had nothing to do with the publication of the school annual that year such work was reserved for seniors but I did write a short piece for the literary section. It was entitled “Boys” and had something to do with the effervescence of young blood. We moved into our spacious new school building on March 9, 1927, and we were all on hand when the dedicatory services took place on the 10th. It was a time of great rejoicing and an occasion for giving thanks to God, for the building was wonderfully adapted to our needs. Mr. L. Dykema was the school janitor, and the move into larger quarters had greatly increased his workload. We lived comfortably at home, but my family was not affluent, and to help defray the expenses of my present and future education I took on the job of assistant janitor. Beginning in mid-March, 1927, I helped Mr. Dykema by sweeping the floors every day after school. When basketball practice or a committee meeting intervened, I either hired a replacement or worked overtime. Eager to reduce the financial burden on my parents, I had previously taken on another job. Early in that academic year I learned that the owner of a men’s haberdashery shop on 69th and Halsted Streets was looking for a salesperson to help him serve the Saturday trade. I applied for and got the job. Beginning in October 1926, I worked in the store every Saturday from nine in the morning until nine at night. We did not stock suits but dealt in such clothing accessories as shirts, ties, belts, suspenders, hats, gloves, handkerchiefs, scarves, socks, spats, and the like. I stayed on the job until the school term ended, at which time I resumed my full-time summer employment at Thomas S. Smith’s. My association with the church’s young men’s society continued that year, and I was privileged to be sent as a delegate to the seventh annual convention of the American Federation of Reformed Young Men’s Societies, held in Grand Rapids on November 3 and 4, 1926. Here I met young men from across the country and also such church leaders as H. J. Kuiper, Louis Berkhof, and Henry Keegstra. My life at home during that year was quite uneventful. I continued to associate with my friends from church, and we tended to carry on as we had before. Our family circle increased when John Vander Meer joined us as a boarder. He was then a senior at the high school and was preparing for the ministry; he was a kind and gentle man and we profited from his presence. Mart entered on a new career when he began to cut and sell meat in Mr. Kamp’s butcher shop at 72nd and Sangamon Streets. Mart had also formed new friendships, and he often brought his friends home for coffee and games. Guest traffic was indeed constant at our house, especially since my married brothers and sisters and their children frequently came to visit. Our daily occupation did not keep us from observing the happenings around us or from sensing the drift of things and being alerted to the current climate of opinion. We noticed, for example, that the Ku Klux Klan was growing in numbers and influence, and we deplored its reign of hooded violence and black lynchings in the South. Although we ourselves were not the beneficiaries of the growing prosperity, we were aware not only that business was flourishing but that, governed by a laissez-faire mentality, it was characterized by cutthroat competition, uncontrolled speculation, and a lust for gain untempered by moral considerations. I had earlier read Sinclair Lewis’s Babbitt, and at school we had been introduced to F. Scott Fitzgerald’s The Great Gatsby. The pictures these books painted of our achievement-oriented society were not heartening. What characterized the middle years of the 1920s more than anything else was a fervent and outspoken pacifism. I myself fell under the spell of the antiwar propaganda, partly because it was vociferous and widespread and partly because my teacher, John De Boer, was a persuasive spokesman for the abolition of war and for the rise of a weaponless society. Government action reflected the spirit of the times. The nations that had been allied against the central powers in the Great War were busily engaged in dismantling their war machines and confidently proclaiming a holiday on the manufacture of munitions and the construction of new implements of war. This was taking place just when Italy was growing in military might and when Hitler was planning to transform Germany into a totalitarian state bent on conquest. Sports happenings of some significance occurred that year. Gene Tunney won the heavyweight boxing crown by defeating Jack Dempsey on September 4, 1926, and in 1927 Babe Ruth hit a record-making sixty home runs. More importantly, on May 20-21, 1927, Charles Lindbergh flew solo and nonstop from Long Island to Paris in the single-engine Spirit of St. Louis; and sometime during that year Henry Ford introduced to the public his Model-A motor car. The year also witnessed the electrocution of Sacco and Vanzetti. On September 7, 1927, I reported for my third and final year of high school instruction. After working all summer and riding long distances in crowded streetcars, it was a joy to be back at school. I was happy to see old friends, to greet new students, and to be engaged again in study and play. The imposing new building, unsullied in its newness, was in itself attractive, and it stood only a short half-block from our house, a fact that carried with it a number of obvious advantages. Also, college was now but a year away, and the prospect of entering it in the not-too-distant future lifted my spirits. There were changes in the faculty. Mr. Bajema had left, and Dr. Frederick H. Wezeman had assumed the principalship. Miss Bode had also left and had been replaced in the commercial department by Mr. Arthur Lanning. The number of faculty members rose to nine with the accession of Mr. William Kooistra, who had been appointed to teach mathematics, and of Miss Effie Zwier, who was engaged to teach English and German languages. The janitorial staff had also increased in size. Assisting Mr. Dykema that year was Mr. Busch and, on a part-time basis, the aged Mr. Koelikamp. With these additions, my mopping and dusting came to an end. This was a boon, for I was about to take on more work than a sensible student should. That year I took twenty hours of English with Mr. De Boer, mostly in English and American literature, ten hours of Latin II with Mr. Sietsema, ten hours of History III with Mr. Swets, twelve hours of physics with Mr. Mouw, and one hour of Bible with Dr. Wezeman. There were now about 200 students enrolled in the school, forty-three of them in their last year of residence. At a class meeting held to elect officers, the seniors chose Harold Vander Velde as vice president and Sydney Youngsma as secretary, and I was asked to serve as class president. The school had hitherto had no student council, and it was now decided to establish one. Five members from each of the four classes were selected to constitute the council, and for no reason other than that I was a senior in office, I was chosen to act as president. In the wake of these developments, a roller-coaster effect dragged me irresistibly into additional student offices. Since I had been president of the all-school athletic association the year before, the students found it easier to keep me on the job than to seek the improvement that others could provide. Something similar could be said about the boys’ literary club. I had previously been vice president of this thirteen-member body, and now my kindly associates felt that the only courteous thing to do was to elevate me to its presidency. I balked a little when I was asked to be editor-in-chief of the school annual, but I was honored by the appointment, and after some hesitation I accepted the assignment. While all this was going on, Mr. De Boer appointed me captain of the debating teams, and Mr. Swets was about to put me at center on the varsity basketball squad. What these extracurricular activities would do to my curricular standing I didn’t know; but there was a backlog of decent grades and I thought I could squeeze by even though Saturdays afforded me no leisure because I had already resumed employment at the Halsted Street haberdashery. The newly established student council got off to a good start. Twenty members sat on the council, and the presence of so many representative students at every sitting was in itself conducive to class intimacy and cooperation. What made the whole thing work as well as it did was the presence at our meetings of the faculty sponsor, Dr. Wezeman. He not only instructed us in parliamentary procedures but also raised many issues bearing on the relation between faculty and students. The athletic association, with Alice Bos as vice president and Grace Dykstra as secretary, served the school by again conducting a fund-raising campaign. With the money collected that year we were able to furnish the gym balcony with a considerable number of spectator seats. The association also brought into existence a girl’s basketball team, the first in the school’s history. 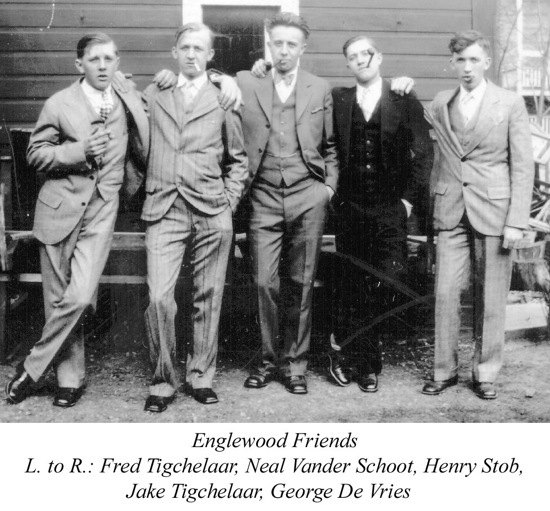 The boys’ literary club, with Raymond Hofstra as secretary and Mr. De Boer as faculty sponsor, held regular biweekly meetings, at which we learned quite a bit about English composition and literary criticism. One feature of our meetings was the “open forum,” in which any member could introduce for discussion whatever subject he chose. The production of a school annual is an arduous and time-consuming task, and one is unlikely to undertake it twice. Fortunately, I was as sisted on the editorial side by ten willing workers, and Harold Vander Velde, who managed the business end, had three competent assistants. The book was dedicated to John De Boer, the memory of whom still inspires those who sat in his stimulating English classes. A “nonsense rhyme” in the annual represented my first feeble attempt at writing poetry. Owing to the excellence of Mr. De Boer’s coaching, the debating teams enjoyed a successful season. The proposition that year was “Resolved that the House endorse the governmental principles of Benito Mussolini.” The negative team, arguing against the proposition, consisted of Sydney Youngsma, Elizabeth Ottenhoff, and Grace Dykstra. The affirmative team, arguing for the proposition, consisted of Bertha Prince, Elizabeth Geerdes, and myself. We engaged in eight debates against four schools the Luther Institute of Chicago, the Central YMCA Preparatory College, Holland Christian High, and Grand Rapids Christian High and we won eight victories, seven of them by a 3-0 score. Under Mr. Swets’s coaching, the basketball team also grew in stature: it won fourteen of the twenty games it played. Particularly gratifying were the team’s victories over the Holland and Grand Rapids Christian high schools on their home floors. This had not occurred before, and, though these schools beat us in return matches, those defeats could not erase the memory of our earlier conquests. There were eight men on our team: playing at forward were Albert Dekker, James Erickson, Raymond Hofstra, and Cornelius Kostelyk; at guard were Henry Smith, John Vanden Berg, and Sydney Youngsma; I held down the center post. What may be of some interest to modern statisticians is the fact that we beat Holland by a score of 14-8 and Grand Rapids by a score of 16-14. Obviously, the game was not played then as it is today. The Christian high schools of Chicago, Holland, and Grand Rapids had for some time been holding interschool oratorical contests in which one girl and one boy from each school competed for the year’s two prizes. At the tryouts held in our own school, Bertha Prince emerged as the school’s female orator and I came to represent the boys. At the trischool meet held in Holland, Bertha came in first in her division and captured the girl’s prize. The Holland representative, Ed Visser, won the boy’s contest, and I had to be content with second place. I look back on those high school years with nostalgia and considerable satisfaction. The school I attended was relatively young and small, and the number of teachers was not large; but the instruction was in general good and in some cases masterful. I remember with delight Mr. Mouw’s course in botany; but my favorite subjects were history and literature, and I owe to Mr. Swets and Mr. De Boer a debt I can never quite repay. I met Henry A. Swets not only in the classroom but also in the gym and in the locker room, and I found him to be everywhere and always a Christian gentleman. An excellent teacher of ancient, medieval, and modern history, he engendered in me an abiding interest in those subjects, and on the playing field he was a model of the true sportsman to all of us. His name led us to refer to him at times as “Henry Always Sweats,” but this was meant to be a tribute to his earnestness and zeal. Most of us not only respected him but loved him, and we did so because he exhibited in his person and bearing the distinguishing marks of an authentic human being and a veritable man of God. John De Boer was a brilliant lecturer and an acute critic of affairs. His course was invariably a stimulus to thinking and reflection, and I owe him thanks for introducing me to many English and American literary classics, from Beowulf and Chaucer down to Henry James. He also helped me to acquire whatever facility I have for speaking and writing in an intelligible tongue. His pacifism resonated in my soul, but I was not wholly convinced that war could finally be banished from a fallen and fragmented world. His theory that language was shaped by usage seemed to make sense, but even at this early stage of my development I thought that objective rules should govern grammar inasmuch as the Logos linked words to reason. I learned from him that Christianity had a horizontal dimension, but I could not even then equate love of God with love of man. And I regret that his often expressed distaste for Latin led me to pay less than adequate attention to that language. Yet, when all is said and done, I must acknowledge that he was one of the most formative and wholesome influences in my early life. There was life, of course, outside the confines of the school. Early in that academic year, Harold Vander Velde and I were absent from school for a period of two weeks. Harold had been delegated by his church society, and I had been delegated by mine, to attend the eighth annual convention of the American Federation of Reformed Young Men’s Societies, which was to convene in Passaic, New Jersey, on October 10 and 11, 1927. With a number of other delegates from the Midwest we began our journey by car on the seventh or eighth and did not return to school until the twenty-first. This was our first visit to the East, and we seized the opportunity to visit as many historic places as we could on the way up and back. We stopped in New York, Philadelphia, Gettysburg, Watkins Glen, and other places, and we lingered in various scenic spots whenever their allure attracted us. The convention was an education and so was the trip, enabling us to justify our long absence from the classroom. I had not hitherto paid much attention to girls, but during my last high school year I formed a kind of romantic attachment to a fine young lady who lived in Cicero. My friends from church, particularly Jack Tigchelaar and Neal Vander Schoot, had girlfriends in that remote locale, and I occasionally accompanied them in order to spend an evening with Tena D. I liked her, and we spent some holidays together; but our relationship stayed casual and unfettered, though I did write her on several occasions in my first college year. A highlight of the year was the celebration that took place when my parents commemorated their fortieth wedding anniversary on March 6, 1928. All the children and grandchildren came together for the event, as well as more distant relatives and a large group of friends. My brother Bill, the firstborn, paid tribute to Father and Mother on behalf of all of us, and a friend of Father read a Dutch poem he had composed extolling the virtues of the celebrants. It was a memorable occasion, and we all lifted our hearts in praise toward heaven for providing us with gifted, loving, and God-fearing parents. During that year the world, of course, revolved around us, as it always does. In the autumn of 1927, Harry Emerson Fosdick’s “National Vespers” appeared on radio, and about that time the second Tunney-Dempsey fight took place. Of greater interest to us as church members was, however, the adoption of a statement by the June 1928 Christian Reformed Synod that declared dancing, card playing, and movie attendance to be “worldly amusements” in which no true Christian ought to participate. That body’s mood relative to this issue came to expression when Synod, having learned that Professor B. K. Kuiper had attended some movies, revoked his appointment as church historian and dismissed him from the seminary. 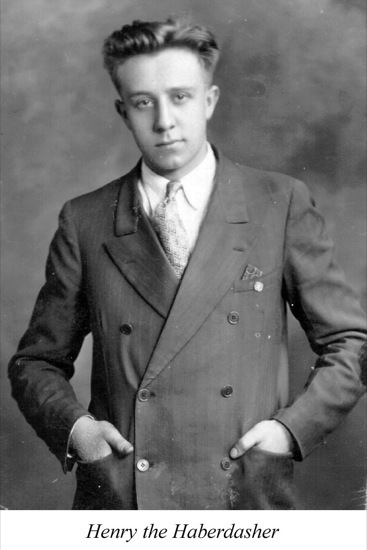 My high school days came to an end when on June 21, 1928, three days before my twentieth birthday, I was handed my diploma at the commencement exercises held in the First Reformed Church of Englewood (located on 62nd and Peoria Streets). There were forty-three graduates, nine from the two-year commercial course, twelve from the three-year commercial course, and twenty-two from the four-year general course. Of the latter, seven students would go on to college that fall, and I was numbered among them. Immediately upon graduation I reported to work at Thomas S. Smith’s. I stayed at my accounts desk until just before Labor Day, after which I turned my eyes toward Grand Rapids, Michigan, and Calvin College.